Looking for a way to have a large impact on your website conversions? You should be looking into conversion rate optimization. This tactic is becoming one of the most popular strategies to move the needle in your business. When you think of conversion rate optimization, you probably think of a/b split testing, multivariate testing, and user testing. Don’t get me wrong, those are some excellent tactics and some of my favorite conversion optimization tools. However, depending on your budget and your website traffic, sometimes those tools aren’t a good match for your business. So what do you do if you want to apply some conversion optimization strategies to your website but you’re a startup with low traffic and zero budget? You stick to the basics, start with best practices. Honestly, even if you have the budget, best practices are still a great place to begin. Here are some of the tried and true conversion optimization strategies you can apply to your landing pages. 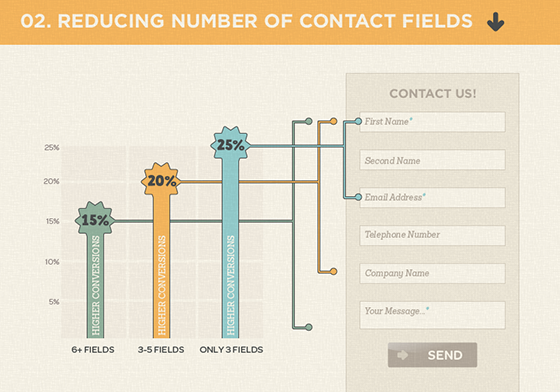 This is one of the most basic rules of conversion optimization, reduce form fields to increase your conversion rate. Getting data is great, but is it worth missing out on conversions? Remove anything that isn’t 100% necessary. This is sometimes a struggle. Instead of looking at each field and asking if it’s required, start with just one field. Can we limit this to only email address? Think about how you can make it happen. The answer might be absolutely not, we have to have a minimum of email, name, and company. Okay, great! We just got rid of business type, phone number, and location. Try to keep your forms with between 1-3 fields. This won’t always be possible, but just keep it in mind as you’re creating forms and trying to improve your conversion rate. Everyone wants to know what the best color is for a call-to-action button. Is it orange, is it green? The answer is: it depends. Don’t get me wrong, color is important. But, when it comes to a call-to-action button, contrast is more important than the actual color. The key is to make sure the button stands out and is a contrasting color to the background and the rest of the site. As long as the call-to-action button is noticeable, the color isn’t as important. The one color you should stay away from is grey. Grey buttons look like they’re inactive and aren’t as likely to be clicked. Write the text on your call-to-action button so it finishes the sentence “I want to…” Clearly describe what will happen when the user clicks that button. Not only does this help manage the user’s expectations, it also helps increase the conversion rate. Even today, people still don’t scroll down. Make it easy for users to see your primary call-to-action as soon as the page loads. Keep that in mind for both desktop and mobile. If the page is long, repeat the call-to-action at the bottom or in the middle, or both if it’s long enough to be useful. Having images is important. But, more specifically, having unique custom images is important. 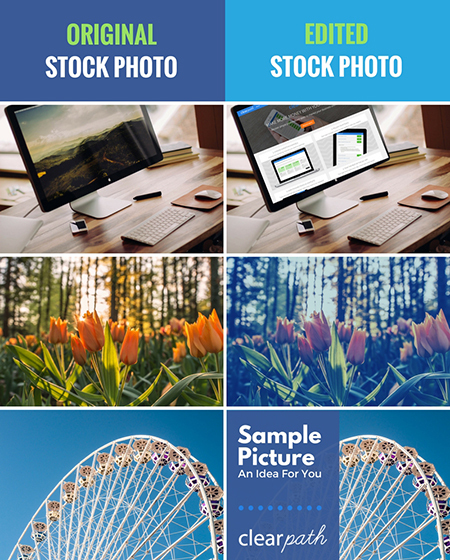 Stock images seem like a great idea, they save you time and money, but they don’t add value. Stock images are seen over and over again. The same images are not only used on numerous websites, but also on billboards, ads on buses, and magazine ads. Whether users consciously recognize them or not, their brains have already seen the images and they are subliminally ignoring them. Take the time to get a custom image. If you can take a photo yourself, do it. If you can take screen shots of your product to create images, do that. Do what you need to get some high-quality custom images. It will go a long way with establishing trust with your users and increasing conversion rates. If you use a stock photo, try to edit the image to include your branding. This can be done a few different ways. You can overlay an image of your product on a device or computer. You can adjust the overall image color or saturation to match the tone of your brand. You can crop the photo in a particular way and embed it in a template for your brand. Editing photos doesn’t need to be difficult and you don’t need to be a Photoshop expert. All of these examples below were done using an online tool called Canva. Canva has a ton of pre-built templates and elements that make it simple for anyone to design a graphic. Finding a way to include a sense of urgency helps increase conversion rate. There are several ways you can go about doing this. You can include a limited time offer with a countdown. You can show inventory numbers and display only X left. You can display how many other people are watching this same item. Carry the idea of the sense of urgency into your call-to-action buttons as well. Use words like “Now” and “Today” to stress the urgency. People like what their friends like. People like knowing that this product has helped someone just like them. Add testimonials that your key demographic can easily identify with. Make it clear that this is a product for people like them. Another way to add social proof is sharing your social media metrics. Show how many followers you have. You can also show user metrics specific to your product to help show that your product has helped many people just like them. If your company has any affiliation with known brands, make sure you advertise that on your site. Were you mentioned in any popular publications? Have big brands used your product? Do you integrate with recognized brands? Share those logos that people will recognize. They might have not heard of your brand, but if you can add a brand to your site that they have heard of, they’ll trust you more. Be careful, logos can steal a lot of attention. They’re important to have, but you don’t want them to steal the focus from your call-to-action. Consider de-saturating them so they are gray-scale. That way, people can see them and identify the brands, but they don’t capture too much attention. Clearly list your contact information on your website. Don’t make users have to search around for a way to contact you. Even users who aren’t actively looking to contact you are comforted when they notice how easy it is to get in touch when needed. How you add your contact information is up to you. You can add your phone number in the header or you can add your full address and phone number in the footer. You can have a live online chat option that floats in the bottom corner of the screen. I’d recommend a minimum of including a “contact” link in your main navigation. On the contact page you can include any contact details you’d like your users to have as well as a webform to make it easy for users to send you a message. 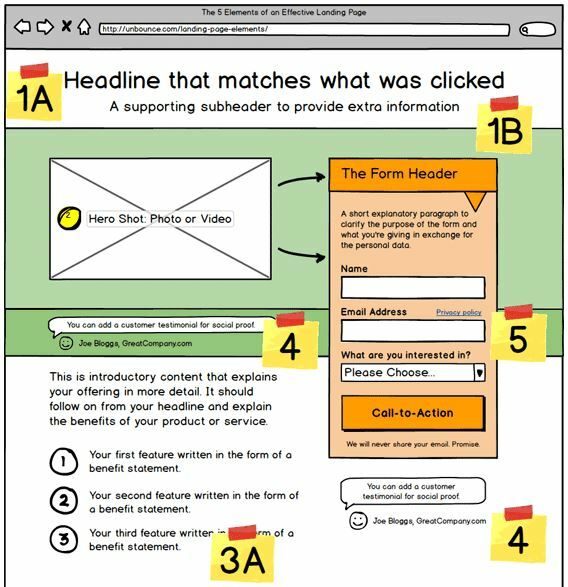 Make sure to include copy above the fold that clearly describes the benefit of your product to the user. Why should they choose you? Include your unique selling proposition (USP) at the top with your headline text. Remember to not only list features (what the product can do) but also include the benefits (what the product accomplishes). Unbounce.com offers a great guide that describes not only how to include these items, but where on the landing page they should be placed. Try to incorporate elements in your landing page design that stimulate an emotional response. One of the emotions you can aim for is happiness. Try adding cute animals to your design. Or, include images of happy smiling people. If those items don’t work with your brand or the particular page, try adding bright colors. Another emotion you can try to capture is pain and frustration. Remind users about the irritation they want to avoid. Once you’ve done that, tie it in by making it clear how you’ve solved their problem. Hopefully these best practices give you a nice place to start with your conversion optimization. Once you build up your traffic and your budget start testing some of these assumptions. Best practices are a great place to start, but remember, your audience could have a different preference. Do you have any conversion optimization tips to add to this list? Any interesting insights from split tests you’ve performed on these items? Let us know in the comments. There’s nothing quite like the excitement of running a split test. In fact, the excitement always seems to generate a flurry of great ideas for the next test. How do you organize and prioritize all of these thoughts into actionable test ideas? You create a conversion test scoring system. What is a Conversion Test Scoring System? The important thing to know about a conversion test scoring system is that it organizes, clarifies, and prioritizes your split test ideas. The actual system can vary depending on your business. Several industry leaders have documented their systems for scoring conversion test ideas, including Optimizely and Chris Goward. The conversion test scoring system I’m going to outline is a combination of those systems. It’s meant to be easy to use with simple yes/no questions. With this system the hardest part is coming up with the hypothesis, determining the prioritization is quick and simple. Chris Goward’s system uses a simple formula where you put in a value for the potential (P), importance (I), and ease (E) for each idea. The result is a numeric value representing the average of those numbers, PIE. This is a nice system and a great way to think about your test ideas. However, the problem I’ve had with this system is it’s subjective. I’ve found that the PIE metric doesn’t accurately prioritize the test ideas unless I review and adjust the parameters for each test every time. The values seem to vary depending on my mood, data from recent split tests, and changes to business priorities. So, it’s important to review and update all metrics when any new data is added. Optimizely has created a different system. Their system looks at ten different rules. If a test idea meets a rule, it gets one point, otherwise it’s assigned zero points. The points are added together and the idea with the largest sum is the highest priority. I liked the idea behind Chris Goward’s system, and the simplicity of a yes/no system introduced by Optimizely, so I made a system that combines these two great tactics. This combined system looks at a total of nine rules that are assigned one point if an idea meets the requirement, and zero points if it does not. Three of the rules identify the potential, four of the rules determine the importance, and two of the rules measure the ease. We then calculate a PIE metric by taking the sum of the average of the three categories, and dividing by 3. The rules you follow could vary depending on your product. The important thing to remember is to determine the rules you want to follow to calculate the potential, importance, and ease of your test ideas. Creating concrete rules will allow you to determine the PIE metric without being subjective. Creating and following the rules to score your test ideas is important. Of course, there is a little more to a conversion test scoring system than just the rules outlined above. Let’s discuss some of the additional fields you should include. I always like to include a column that documents who submitted the test idea. This helps establish a data-driven culture in your workplace. It’s important to encourage everyone at the office to submit test ideas. If the test is implemented, share the results and findings with the person who submitted the idea. If a test is successful, you can share the results with the entire company and give some credit to the idea submitter. The test idea should be written in the form of a hypothesis. The idea should be structured in an If…,then… statement. Creating a hypothesis helps you identify the underlying reason you are performing your test. Once you have a hypothesis, you can identify the specific action you want to take to test the hypothesis. Structuring it in this manner provides an easy way to progress after a failed experiment. If a test fails, the action you took wasn’t the correct one. But, do you still believe in the hypothesis? If so, determine another action you can make to test the hypothesis. Document the specific page you will be testing. Identify the Key Performance Indicator (KPI). This will be the main metric you track to determine if the test was successful or not. It’s best practice to track multiple KPIs, but you need to understand the primary KPI this test will affect. Keep in mind, you want to choose a KPI directly related to the test idea. If the idea tests an element on the homepage which is at the very top of the funnel, choosing payment or a KPI that triggers at the end of the funnel is likely not a good choice. Users will encounter many other variables in the middle of the funnel that could skew the data. So, now you have documented the person who submitted the idea, created the hypothesis and action, determined the page and KPI, and determined if each rule receives one or zero points. Now, the PIE metric to determine the priority needs to be calculated. The PIE calculation can vary depending on how you adjust the rules. You want to calculate it by taking the sum of all values within each category and multiplying the result by ten. Then you divide the result by the number of values within the category. You add the calculated value for each of the three categories, and then divide it by three. Once you have the final metric, you’ll want to sort the list from highest to lowest value. The higher the PIE metric, the higher the priority of the idea.